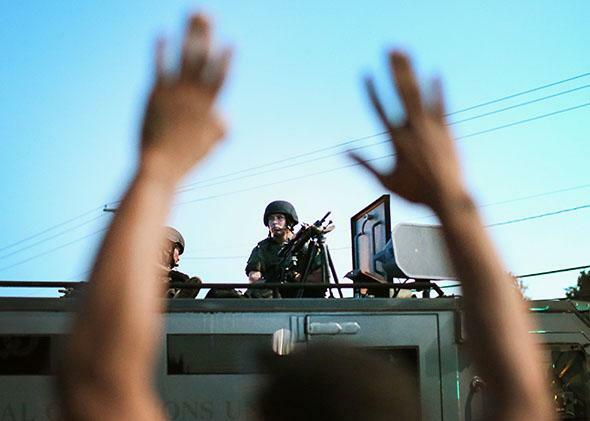 DOJ Ferguson report: Will it lead conservatives to abandon their love of the police? Could the DOJ’s Ferguson report lead the right to abandon its love of law enforcement? An icon of conservative outrage? Police stand watch as demonstrators protest the shooting death of Michael Brown, on Aug. 13, 2014, in Ferguson, Missouri. When people talk these days about the bipartisan push for criminal justice reform, what they’re mostly talking about is incarceration—how to reduce the number of Americans in prison, how to make the system less punitive while maintaining public safety, and so on. When it comes to issues of policing and law enforcement, the national conversation tends to follow predictable partisan lines, with liberals demanding more police accountability and conservatives vigorously defending America’s officers against charges of overzealousness and brutality. When Michael Brown, an unarmed black man, was shot dead by a white officer in Ferguson, Missouri, last summer, the protests that ensued all over the country were strongly associated with the left, while support for the officer came mainly from the right. In the wake of the Ferguson report released Wednesday by the Justice Department, which found that the city’s mostly white police force has engaged in racial discrimination for years, and has routinely used fines and court fees as a way to generate revenue for the local government, I called Pat Nolan, one of the most prominent conservatives in the criminal justice reform movement. Nolan, a former member of the California State Assembly who served time in federal prison for campaign finance violations during the mid-1990s, was later the president of Justice Fellowship, a Christian group that advocates for a broad range of criminal justice policy changes. I wanted to know whether he thought the Ferguson report might change how conservatives think about police misconduct. Did you read the Ferguson report? I’ve read ­­about it, and it’s troubling. Essentially they were running the police department as a profit center for the city—just like many police departments are using civil asset forfeiture to generate income for the department, where the law allows them to seize real or personal property from people, and puts the burden on the property owners to go to court and prove the assets were legally obtained. And asset forfeiture is something that conservatives have sought to reform for decades. I hadn’t thought of the connection between what’s been happening in Ferguson and asset forfeiture. Yeah, among conservatives and libertarians—asset forfeiture [is considered] “policing for profit.” As I read the reports about Ferguson, that immediately came to mind: This is policing for profit. This is viewing the police as a profit center. And that’s not the purpose of the criminal law. I don’t want to generalize too much, but the discourse over Ferguson has so far been divided along political lines, with people on the left saying that the police are taking advantage of their power and commentators on the right speaking up for the honor and legitimacy of law enforcement. Do you think these revelations about the revenue-generating function of the Ferguson Police Department would change conservatives’ position in this debate? Yes, I think it will. One of the problems in Ferguson was the false narrative that Brown was this, you know, gentle giant who was selected and shot down just because of his race. And I think the evidence is pretty clear that he was a thug. You just look at what he did to that convenience store owner—this was not a gentle giant that was being picked on. So I think there was a defensiveness that conservatives had, because they felt the police were being unfairly portrayed as having wantonly shot a good kid down in cold blood. Not that a bad kid deserves to be shot. But it certainly changed the narrative once we found out that he had just strong-armed the convenience store. This report puts a whole different light on it. And I think it will provoke discussion among conservatives about whether this fits a larger pattern of some police departments—not most but some police departments losing sight of the fact that they’re supposed to be peacekeepers, and instead they’re revenue raisers, raising revenue from those who can least afford it. I read one of the examples—it was just heartbreaking. I think his name was Michael and he wrote Mike, or something like that, and they charged him with false [declaration]. That’s not law enforcement. That’s not what people go to the police academy for. That’s not what we have them swear to uphold the law to do. It’s a real perversion of the system. And to conservatives that’s disturbing, to have government agents with that much power and no one looking over their shoulders. Protesters face riot police during a protest at the Ferguson Police Department in Ferguson, Missouri, on Oct. 13, 2014. There’s this bedrock conservative principle of minimal government intrusion in the lives of citizens, but that principle seems to run counter to the deference that many conservatives reflexively grant to the police. Is there a tension here? Yes, I think that’s the tension. On the one hand we view the police as the line that holds the Wild West at bay. On the other hand, you know, who will watch the watchers? These folks are supposed to be the guards who protect society, but who will watch them to make sure they’re not lawless? And that has always been a tension. But for conservatives, I think in the last 10 years or so, there’s been a growing realization that we had turned a blind eye to many excesses that were being done in the name of keeping order, when in reality there were a lot more venal purposes behind some of these policies. 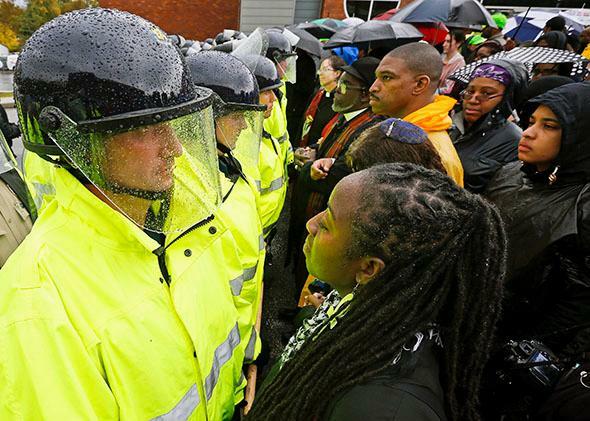 What do you think it would take for more conservatives to start questioning police practices? Well, I think it’s already happening, but I would go broader than police. There’s a lot of evidence that prosecutors are really out of control, knowingly putting jailhouse snitches on the stand that they know are lying, trying to get convictions for the sake of convictions rather than to do justice. And the police of course are part of that. But it’s a broader thing, which is the assault of government: regulatory agencies as well as criminal justice institutions against the average person. Right, but the intrusion of regulatory agencies is something conservatives can talk about easily. Isn’t it kind of taboo for conservatives to talk negatively about the police? No, I think conservatives are [talking about it]. I think a better example than Ferguson is Eric Garner. There was, among many conservatives, outrage at that. This was a man killed for taxation. The reason it was a crime was he was selling loosies, and the reason loosies are illegal is that there’s no tax stamp on them. That’s what that was all about. Is it worth a man’s life? I read articles by a number of conservatives who condemned the police action in that case, saying this was out of control—George Will, others. So I think it’s already there. Now, that doesn’t mean all conservatives are. What we’ve found is the squishy moderates—the RINOS—are the ones we have trouble with. They’re the saluters for the prosecutors and police. But the conservatives and Tea Party people, they’re very much aware of the abuses. They have a healthy suspicion of government agencies, police included. So, I’ve already seen that the conservative movement has shifted. And now I’d say the majority position is very much [in favor of] looking very closely at police power. In my experience, though, most of the conservative commentators who engage on criminal justice issues are interested in sentencing and civil forfeiture, not policing. Yeah—because it does divide conservatives. And frankly it’s not something we lead with, because you want to keep your troops together. You want to have maximum impact. You take on battles that you can win. But also you’re talking about what the next issues are. And I think that the concern about policing is in that second tier—it’s not the lead thing, like sentencing, like re-entry, like asset forfeiture, but I’d say it’s right behind that. So, yes, it’s not something you’re going to read a lot about, but it is something I see and hear. There’s a lot of concern and discussion beneath the surface. The conservative movement is sort of feeling its way along. Like, this report will be grist for a lot of discussions before you see anything publicly. There will be a lot of talk among conservatives—what are the implications of this? What are the alternatives? How do we address this? Do police review boards help? You know, what is workable? And part of the discussion will be, How do we keep the proper function of police, and make it possible for them to provide the protection that we need, while still restraining this bad behavior? So, there will be a lot of discussion before anything is public. But it’s definitely there, bubbling beneath the surface.